Towering high over the coastal plain of Jesselton (Kota Kinabalu) is indeed an awesome experience; the scarred greenery (unfortunately), the city, the South China Sea can be seen as we glide higher and higher. The mid-year flights are the best because of the ideal wind speed blowing from the west which created a dynamic that pushed the wing upward. Most of the time it rains around this time and the sunny shine next day would heat up the ground creating thermal bubbles that also helps paragliders to gain more heights and thus extend their distance and time. 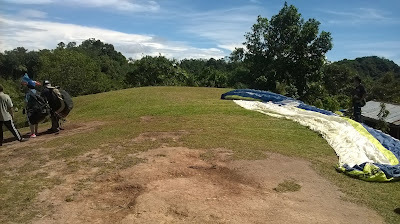 North Borneo (Sabah) has many things to offer and one of them is paragliding at KOKOL HILL. The hill is about 45 minutes drive from the city center. Besides paragliding, this hill offers other scenery for travelers. Paragliding is a recreational adventure sport. It is lightweight, foot-launched free flying with no rigid structure. The pilot (and the passenger) sits on the harness suspended below a fabric wing. I always say "flying would set you free" because you are gliding so high without the constrains of an airplane. Sometimes I feel like I am dreaming; just seating on the harness thousands of feet above the ground. It is scary at first, but later you will feel wonderful. Missing this experience when visiting Borneo is a big mistake. Anyway, I really thanks my cousin Chris Lammert for encouraging me to "fly" above Jesselton.